There are 2 kinds of people in this world: Those that love Salmon. And those that don’t. That’s probably true of most things, but I couldn’t come up with a better opening line. So, there you go! I happen to be the former and so is little V. I hereby declare my eternal love for Salmon. R, on the other hand, doesn’t quite get what the fuss is all about! But we [V and I] find a way to work around it. We just make him eat it. 😉 And he does. 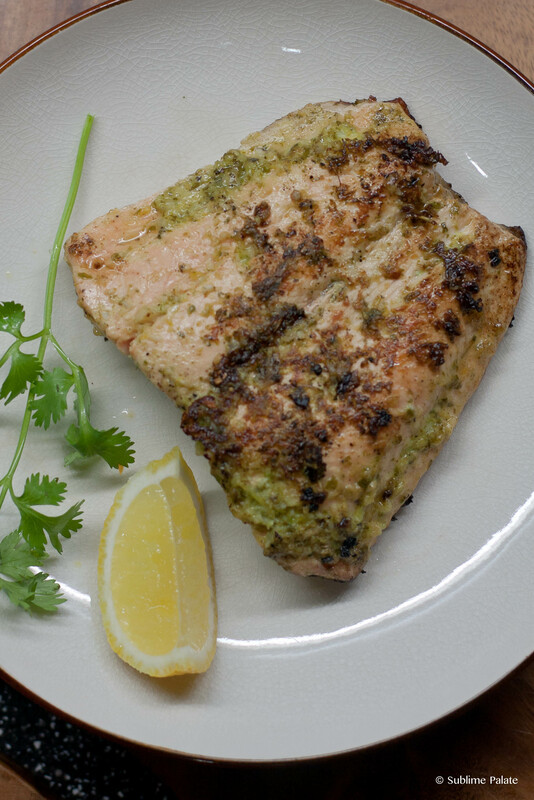 In it’s simplest form, all you need is some crushed garlic, salt, pepper and olive oil marinade with the salmon. Pan fry (with minimal oil) and you are done. 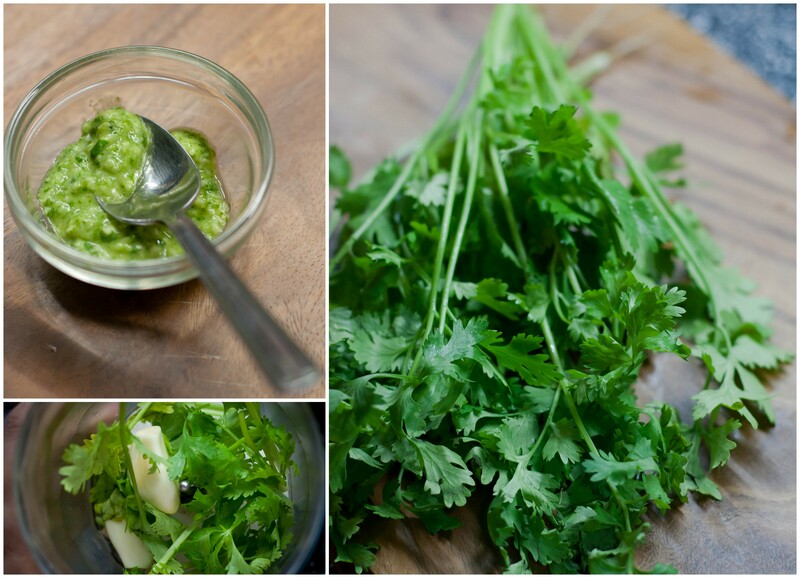 In this version, I added a slight variant – fresh coriander leaves or cilantro. If you have a particular dislike for coriander, feel free to omit the coriander leaves. 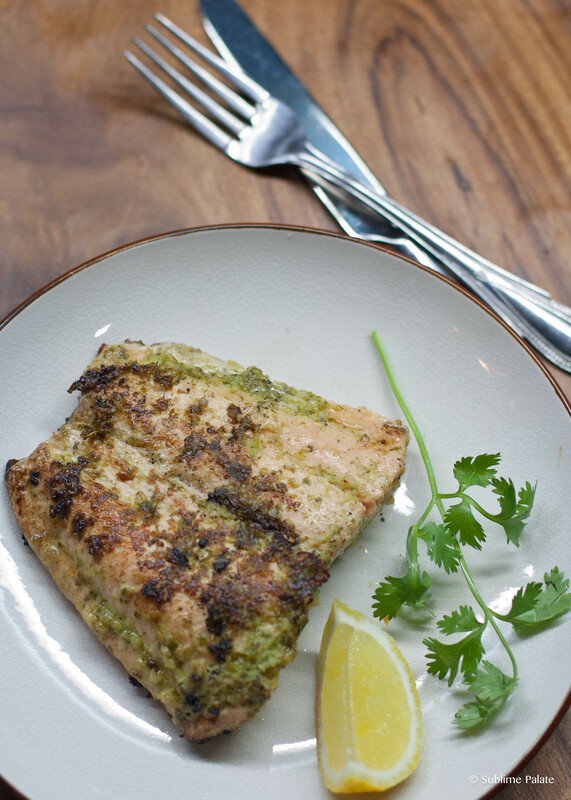 We usually have this Crispy Salmon for dinner on a weeknight when I don’t want to spend too much time cooking. This goes well with a simple vegetable pasta or just plain rice and stir fried vegetables. Fresh coriander leaves – a bunch. Discard the roots. 1. 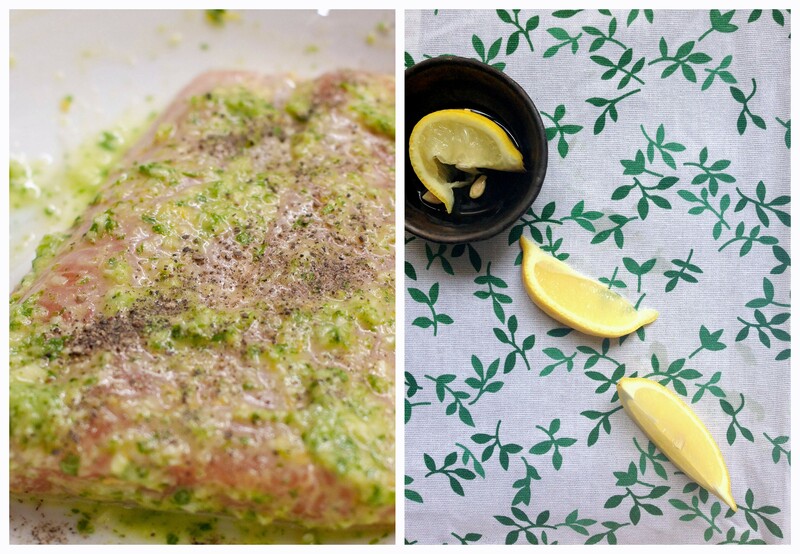 Squeeze the lemon juice and zest on the salmon fillet. Sprinkle sea salt to taste. Put a little less than required as we will also season the sauce. 2. Prepare a quick blend of the garlic, coriander leaves including stalk but not the roots, a tsp of olive oil and sea salt. 3. 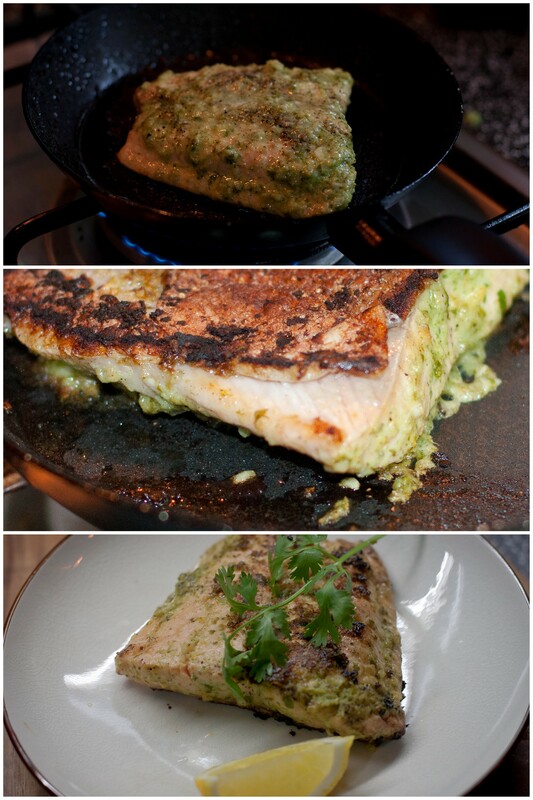 Rub the prepared coriander, garlic sauce (the marinade) on the salmon. Sprinkle a dash of black pepper powder. Let the Salmon marinate for about 15 minutes. Rub the Marinade on the salmon. 4. Heat a pan. Add the remaining olive oil (2 tsp). 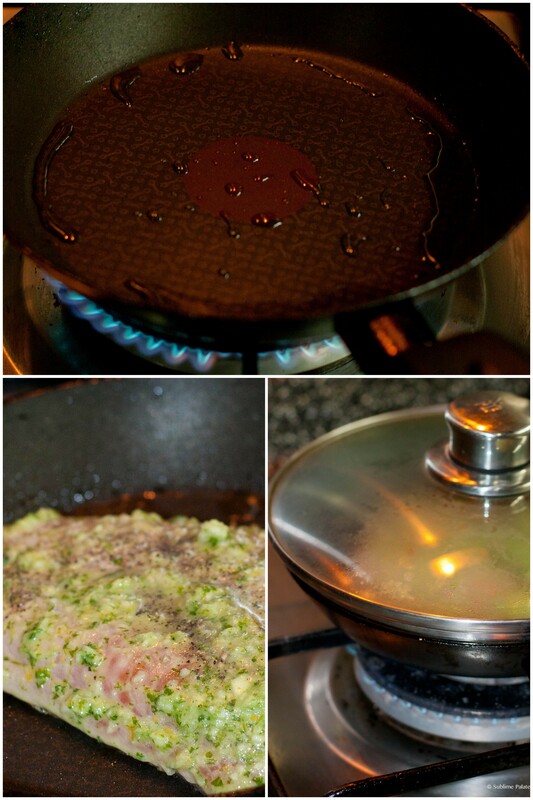 Make sure the the oil is hot before placing the salmon fillet in it. This step is important to prevent the fish from breaking and disintegrating. 5. Place the salmon fillet, skin down first. Reduce flame to lowest. Cover and let it cook for 5 minutes. Heat a pan. Add olive oil and place the marinated Salmon, skin down. Cover & let it cook for 5 minutes. 6. After 5 minutes, turn the salmon for another minute. Do not cook on this side for long as the salmon will start to overcook. Turn the Salmon over and cook for another minute. 7. Serve w lemon wedges.